As you can see from this screenshot, the Home link is active in my current navigation (powered by managed metadata) as I'm on the homepage. Under Company are five links, all of which I would like to hide unless the Company link is active. How can I do this? 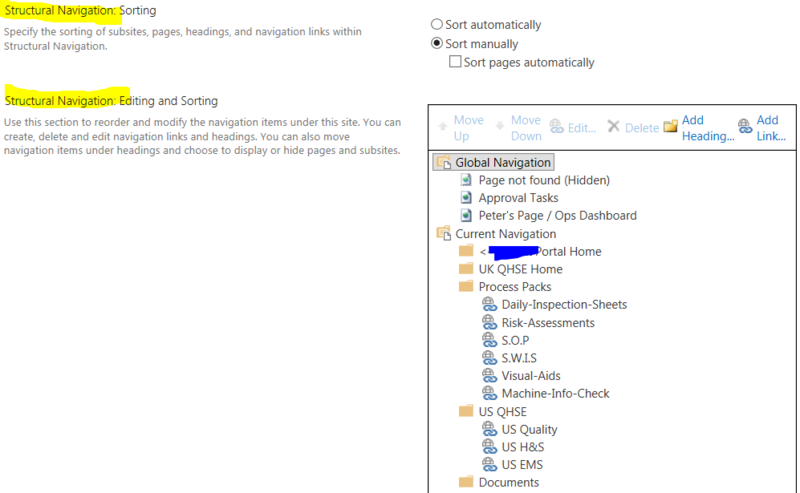 Do I need to configure something in the term store, or do I need to edit the source code using SharePoint Designer? (BTW - I'm using SP 2013). The navigation you are referring to is called 'Current Navigation'. 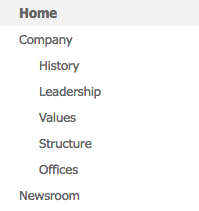 Take note of the Radio Buttons giving different options - your navigation might be configured differently. If you want to hide links from the 'Current Navigation' (left side of screen), scroll down further in the menu. I am using Structural Navigation, so menu looks as you see in the picture below (yours would look different if the navigation is configured differently to mine). To remove a link, select it and then select delete. You might want to take a screen shot of your navigation and put it someone safe for reference in case anyone ever asks "which links did we used to have, there were some useful ones..."
Not the answer you're looking for? Browse other questions tagged navigation managed-metadata term-store managed-navigation current-navigation or ask your own question.